Kit includes everything you need for your AR Drone! NEW! This is a high-performance LiPo battery pack for the Parrot AR.Drone and AR Drone 2.0 version. The ultimate upgrade from the stock pack, this pack boasts a large capacity of 1800mah for 45% more flight time. It features a 100C rating for tons of punch and extra power. 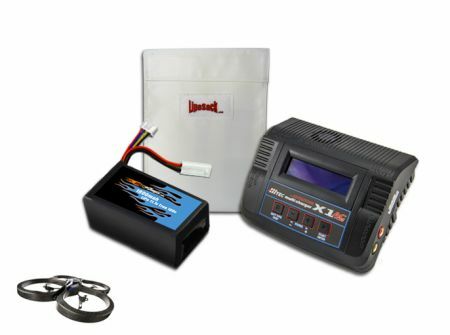 Pack includes JST-XH balance connector and small Tamiya female plug so you can charge it with your original stock wall charger or the charger you choose in this kit. These are the best batteries! They last twice as long as other batteries! Very well worth the few extra dollars! The only battery I will purchase! Perfect battery for the mod. Bought this to be used in the Alpinetech A+ joined with the DNA200 faceplate here http://shpws.me/JUHn Battery life is insane and best of all it has a warranty, don't go cheap on your mod batteries or you end up paying in the end. Great Batteries, Even better customer service.